According to Windpower Intelligence, the research and data division of Windpower Monthly, SGRE has installed more than seven times as much offshore capacity than its nearest rival since 2001 — 11,644MW to 2,785MW. The global pipeline points to tighter competition between the two offshore giants, though. Windpower Intelligence reports that SGRE has 6,374MW in confirmed turbine purchase agreements (TPAs) in 2019-21. MHI Vestas is not far behind with 4,395MW in the same period. These figures do not include SGRE's "preferred supplier" status for 900MW in Taiwan, or MHI Vestas' similar role for the 800MW Vineyard project in US waters. Until the end of 2010, Vestas and Siemens (as they were known then) were pretty evenly matched in offshore numbers. Vestas had installed 1,382MW since 2001, against Siemens' 1,340MW. But the German manufacturer moved decisively ahead with the introduction of its 3.6MW turbine in 2010, just as the European offshore market was starting to take off, and just as Vestas was hitting the skids financially. Over the next five years Siemens installed 1,574 offshore turbines for a total capacity of 5,719MW. Vestas managed just 219 units for 662MW in the same period. The tables started to turn in 2017 with the first commercial deployment of the 8MW-plus MHI Vestas V164 turbine at the UK's Burbo Bank Extension. 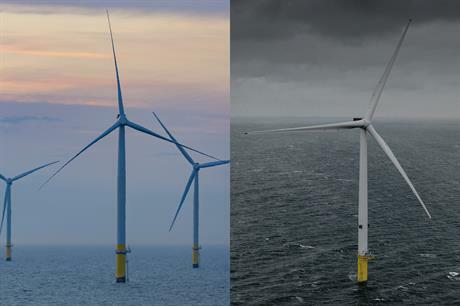 Since then MHI Vestas has always been one step ahead of its European rival in terms of nameplate capacity, and the orders have stacked up as a result. The turbine's rated capacity has since been stretched to 10MW and a 174-metre rotor is believed to be under development. SGRE's efforts are now focused on its 8MW-plus direct-drive machine with a 167-metre rotor but its sizeable track record, and the relationships it developed as a result, have held it in good stead. Additionally, its 3.6MW workhorse, upgraded to 4MW and built under licence by Shanghai Electric under the Sewind brand name, has done good business in China, with over 800MW now installed.